Calderdale Council has admitted that major lessons must be learned for future projects as the Piece Hall nears completion, a year after it was first promised. Work on the £20 million scheme to transform the 18th century market hall is “nearing the final weeks” after being beset with delays, although an opening date is still yet to be set. 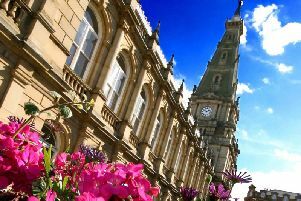 With £7 million of public money invested by Calderdale Council, the project leaders are also still remaining tight-lipped over the delay costs despite being quizzed during a scrutiny meeting at Halifax Town Hall this week. Robin Tuddenham, director of communities at the council, said: “We have had a number of challenges. Inevitably with a Grade-I listed building, the level of consultation that is required is considerable. The council’s use of resources scrutiny panel was told that the negotiations are still ongoing with the contractors over the final costs, with hopes that it will be a matter of weeks, rather than months. Tim Renwick, project leader, added: “If we do get the contractor to agree with a figure we think is appropriate, it will be announced soon. Work began on the project in October 2014, with a grand vision of creating a centrepiece attraction for the town. * The discovery of an ancient burial ground. * Asbestos found in two areas in the later stages of the work. * Unsuitable dry-stone wall foundations unearthed. As a Grade-I building with no detailed historic drawings, the project leaders said work has been forced to adapt to the problems. Councillor Bryan Smith added: “It’s running 18 months over and that’s excessive, I do think we need to look at that in the future, it’s been a cause of concern to the community.